The DPI, conducted by Dalia Research in collaboration with the Alliance of Democracies and Rasmussen Global, is based on nationally representative interviews with over 125,000 respondents in 50 countries worldwide. This represents over 75% of the world’s population and 75% of the world’s GDP. 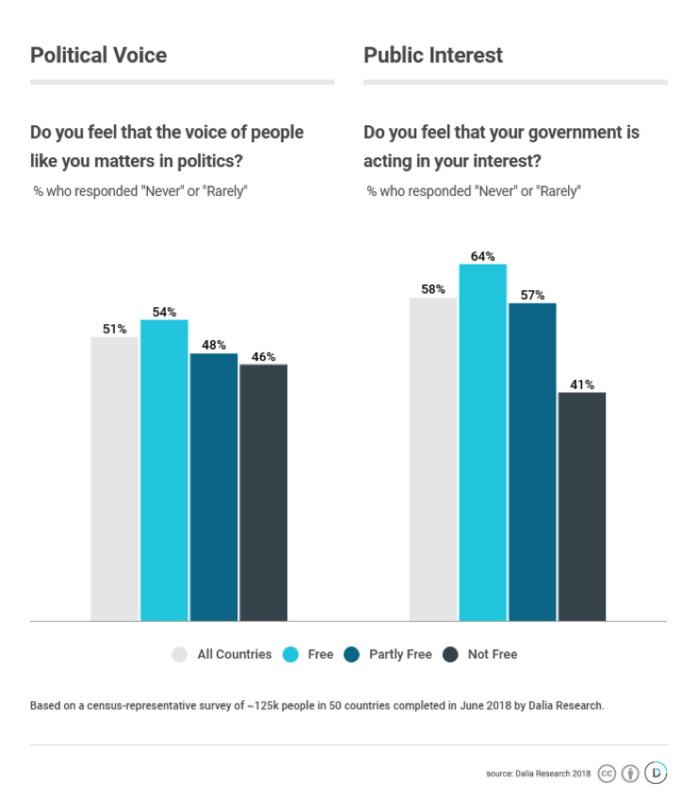 Perception of Political Voice : Do citizens feel their voice matters in politics? Perception of Public Interest : Do citizens feel their government acts in their interest? Across the globe, governments are failing to convince citizens their voice matters and that institutions are acting in their best interest. More troubling, according to survey data, is the finding that public disillusionment is greater in democracies than in non-democracies. An astonishing 64% of citizens living in democracies responded their government “rarely” or “never” acts in the interest of the public. For example, the United States and the United Kingdom, long seen as leaders of the free world show glaring deficiencies. While not faring as poorly as other democracies, nearly two thirds or more of their citizens believe their governments are not acting in their interests. Researchers noted that while citizens in democratic societies might be inherently more critical of their government than those living in non-democratic societies, perception is often as important as reality, and therefore the implications of the findings remain relevant and insightful. The study is being released to mark the inaugural Copenhagen Democracy Summit on June 22nd 2018, at which global leaders are gathering to discuss the challenges facing democracy. In the eyes of the public, governments around the world are perceived as failing. 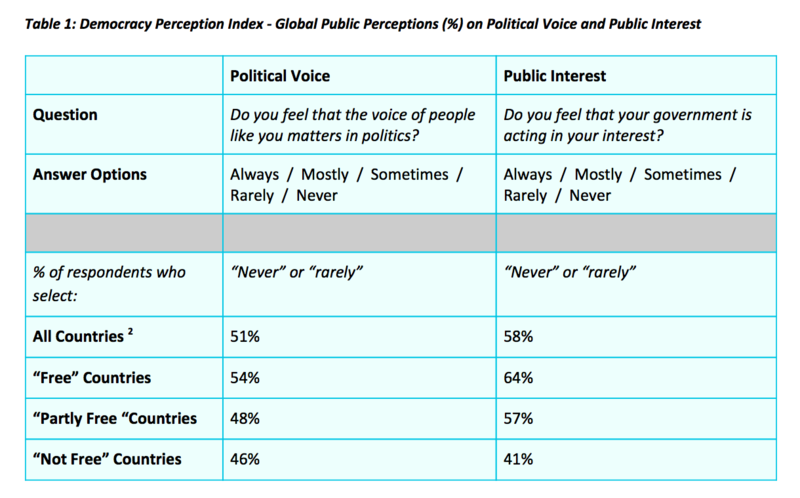 More than half of the world (51%) thinks that their voice “rarely” or “never” matters in politics, and as much 58% believes that their government doesn’t act in their interest. (See Table 1). Democracies are seen even more negatively than non-democracies. In democracies, a majority of the population (64%) believes that their government “rarely” or “never” acts in the interest of the public. 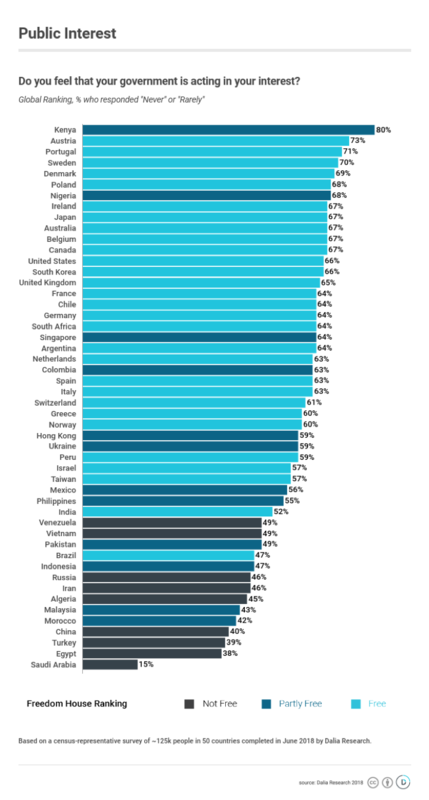 In non-democracies, people are less pessimistic, with only 41% saying the same. (See Table 1). Citizens in democracies don't feel their voice matters: Over half (54%) of citizens living in democracies think their voices “rarely” or “never” matter in politics versus 46% in non-democracies. Of the ten countries that perform the worst on ‘political voice’, nine are democracies. 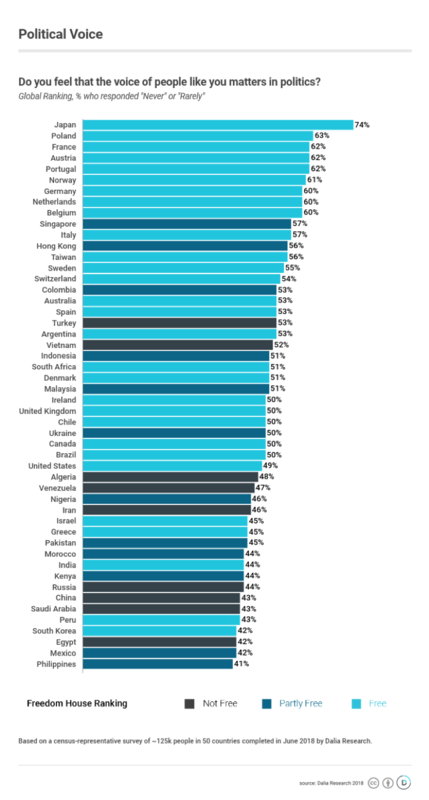 74% of citizens share this sentiment in Japan, followed by Poland at 63%, France, Austria and Portugal at 62%, Norway at 61%, and Germany, the Netherlands and Belgium at 60%. (See Graph 1). Citizens in democracies don’t feel the government serves their interest: Of the ten countries where the public overwhelmingly says the government “rarely” or “never” acts in their interests, eight are democracies. This view is shared by almost two thirds (67%) of the electorates in Australia, Belgium, Japan and Ireland. In Poland it is even higher at 68%, and the sentiment climbs in Denmark (69%), Sweden (70%), Portugal (71%) and Austria (73%). (See Graph 2). For further information contact Nina Schick, Director of Data and Polling on nsc@rasmussenglobal.com or +447522115934. Democracy Perception Index (DPI) Methodology: This report presents an overview of a study conducted by Rasmussen Global and Dalia Research between 2018-06-06 and 2018-06-18. The sample of n=125,000 was drawn across 50 countries, with country sample sizes ranging from 1,000 to 6,0003. Nationally representative results were calculated based on the official distribution of age, gender and education for each country’s population, sourced from most recent and available data from Barro Lee & UNStat, and census.gov. Copenhagen Democracy Summit: The Democracy Perception Index is being released to mark the inaugural Copenhagen Democracy Summit, organised by the Alliance of Democracies in partnership with Rasmussen Global and Dalia Research. The Copenhagen Democracy Summit is an annual conference bringing together political and business leaders, including current and former heads of government, from the world’s democracies. The purpose of the conference is to build the intellectual and interpersonal foundations for a robust alliance of the world’s democracies. Speakers at the Copenhagen Democracy Summit include Joe Biden, former Vice President of the USA, Anders Fogh Rasmussen, former Secretary General of NATO and Prime Minister of Denmark, Felipe Calderón, former President of Estonia, Toomas Hendrik Ilves, former Prime Minister of Spain, José Maria Aznar, former Prime Minister of Canada, Stephen Harper, former Deputy Prime Minister of the United Kingdom, Nick Clegg, American Economist and Entrepreneur, Professor Carl Schramm, CEO of BenevolentAI, Joanna Shields, VP of Global Policy Solutions at Facebook, Richard Allan, CEO of Codewise, Robert Gryn, President of the Global Fairness Initiative, Karen Tramontano , VP of EU Government Affairs at Microsoft, John Frank, former US Secretary for Homeland Security, Michael Chertoff, former editor-in-chief of BILD, Tanit Koch, among many others. Alliance of Democracies: The Alliance of Democracies Foundation is a non-profit organization founded in 2017 by Anders Fogh Rasmussen, the former NATO Secretary General and former Prime Minister of Denmark. The Foundation is dedicated to the advancement of democracy and free markets across the globe. Dalia Research: Founded in 2013 and headquartered in Berlin, Dalia is a fast-growing technology startup focused on giving research agencies, brands, consultancies, academia, public institutions and other organisations access to high-quality market and opinion data at a global scale. Harnessing the app economy and combining advanced data science with real-time targeting and attribution technologies, Dalia’s insights engine distributes millions of micro surveys worldwide to gather and analyze real-time data on consumer attitudes, public opinion and market trends. With a keen eye on future trends in the insights industry, Dalia is dedicated to improving research quality and precision through cutting edge statistical methodologies. Backed by some of Europe’s leading venture capital firms, Dalia is the the proud winner of several industry, technology and data awards. In 2017 Dalia also raised $7million in a Series A funding round led by Balderton Capital, with participation from existing investors Wellington Partners and IBB-Bet. Since launching, Dalia has generated over a billion answers from people in more than 100 countries. The resulting data is cited in over 2.000 news articles globally, including in leading news journals such as The Economist, Le Monde, The Guardian, South China Morning Post, El Pais, The Financial Times, Vice Magazine, The Washington Post, Der Spiegel, Business Insider, and Quartz. Rasmussen Global: Founded in 2014 by Anders Fogh Rasmussen, Rasmussen Global is a firm with a purpose. It helps democratic governments and companies navigate a complex world by harnessing decades of political expertise with data-driven analysis. Rasmussen Global shapes and delivers winning campaigns to influence opinions, policies and decision-makers at the global, local and national levels. It brings together a team with high-level experience in government and diplomacy, with offices in Copenhagen and Brussels, and a presence in key capitals including Berlin, Paris, London and Washington DC.